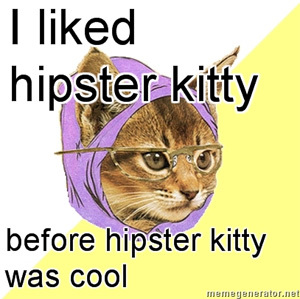 Submit a hipster kitty photoThanks to Jennifer Hoppa for the photo. This kitty was posted on Monday, February 22nd, 2010 at 11:03 am	and is filed under Artsy Cats. 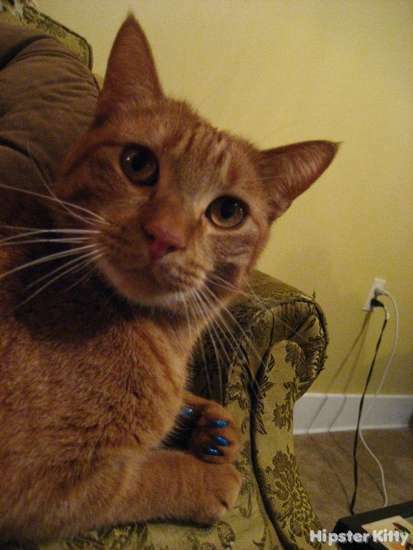 You actually painted your cat’s claws? Do you realize that they chew on their claws to groom them and that nail polish, of ANY kind is toxic to felines? You may as well just shoot the poor thing, you moron! We definitely appreciate your concern for our feline friends, but this isn’t a photo of actual nail polish, it’s Soft Paws vinyl claw caps. 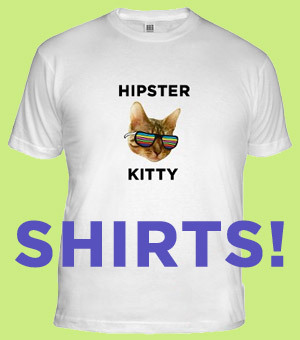 We love kitties at Hipster Kitty, and wouldn’t publish anything harmful. For instance those awful kitty tattoos are pretty hipster, but downright disgusting and we will never feature them. Thank you Hipster Kitty people for correcting ‘concerned’ for me. Kingsley is safe and happy with his non-toxic soft paws. He loves them! Kingsley is so hip. It’s about time he garnered the fame he deserves.